Cute Tute: It's Sew Easy To Make A Bronte Quilt! Cute Tute: It’s Sew Easy To Make A Bronte Quilt! Quilting can be a super-precise craft that takes many hours of careful work. BUT it can also be a speedier, made-with-love type thing, if you just want to whip up something for a pal. 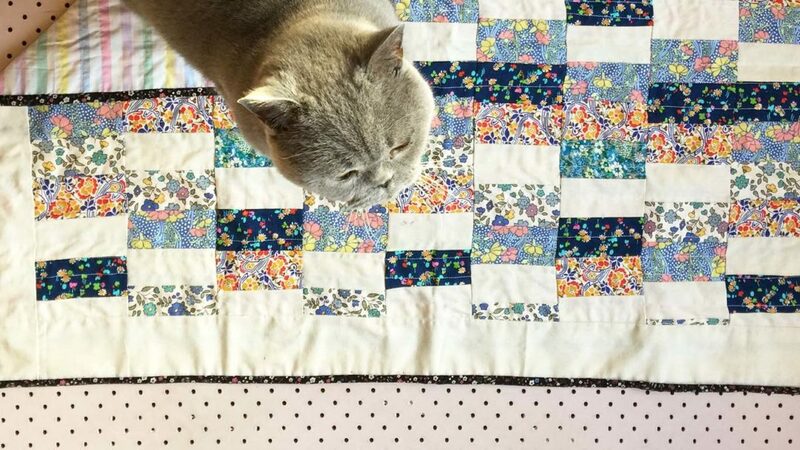 You may or may not know that I made Bronte (who is a cat) a quilt last week. I kept my mind firmly on Little House On The Prairie, Gee’s Bend and the scrap quilts of the internet and took a one hundred percent random and imperfect approach. The result was a) cute and b) finished and c) quick which I KNOW is what many people want. 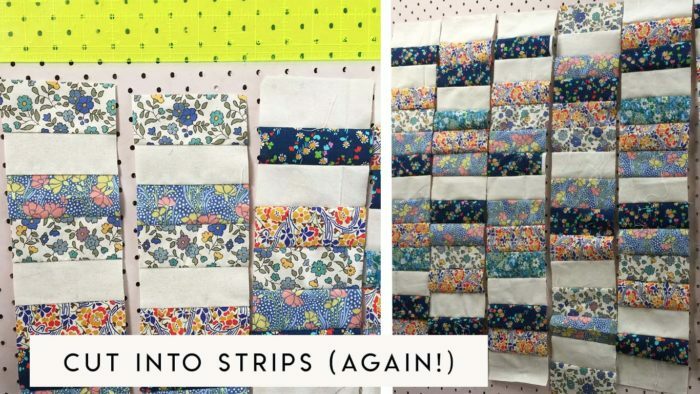 Once you make a simple, low-pressure and scrappy quilt, you can level up to make more precise, nail-biting and ambitious projects. For now, though, you could dip your toe in the water with something like this?! My advice to you is – relax. Think of it as a bit of an improvised jigsaw puzzle. 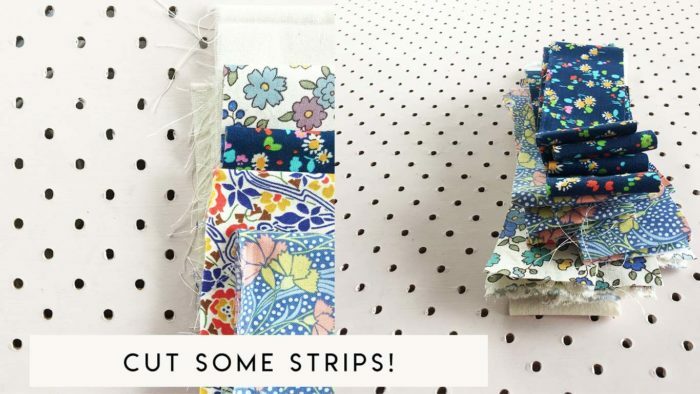 Make pretty patchy pieces from your strips of fabric and then trim and stitch them together. Make it work. I will show you how I did it, but this is just a Guide To Not Being Too Uptight and a push to actually do it. Remember quilts were often made to use up scraps and create something cosy for people that were loved. Make yours with that kind of loose, loving attitude and you’ll be sorted. Forget ‘mistakes’ and ‘perfection’ and just patch and stitch your little heart out, trimming things into shape as you go. Because I made Bronte (who is a cat) a quilt when I was at home a bit poorly, I didn’t want to venture out and spread my germs about in the sewing supplies shop or on the street. So I just used things I had at home. I have a rotary cutter, plastic ruler and cutting mat, so that makes it easy to cut neat lines that match up. 1. I cut out even strips of fabric. I cut lots of those. I cut mine 3 inches wide but you can definitely cut them bigger (I’d recommend 3 inches wide.) Length-wise my fabric was pretty similar lengths to start off with. 2. 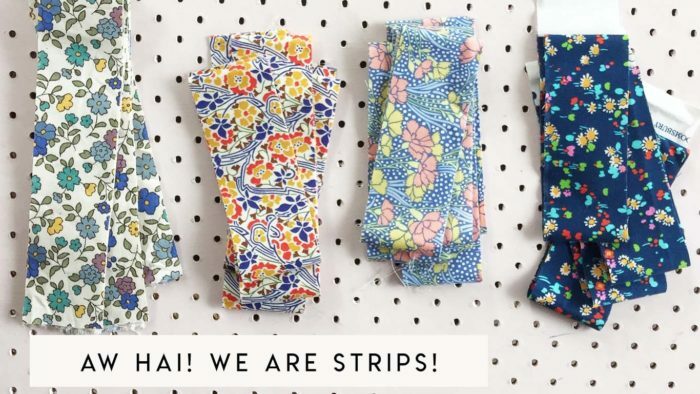 I sewed them together – just take two strips, put them ‘right sides’ together – and sew together with a 1/4 inch seam. 3. I did that lots of times until I felt I had enough to make a quilt the size I needed. I actually made two panels of strips so it didn’t all get too unwieldy. 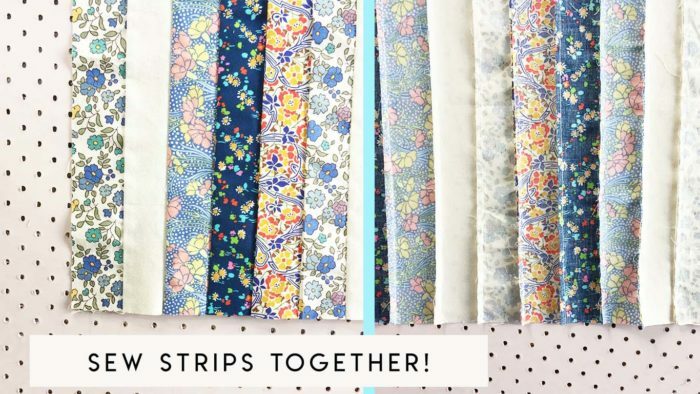 You can make as may panels as you need to – depending on the length of your original fabric strips. Later, we CUT them up, and sew them together again, as you will see. 4. I pressed all the seams in the same direction so they’d be easy to sew over and neat. 5. Then I cut them into strips, across ways so you have lots of prints in each strip, like so. 6. I sewed those strips together to make the quilt top. I arranged the strips a bit first, but I tried VERY hard to be super random so that things didn’t look too neat and composed. Again, you just put the right sides of the fabric strips together and sew a 1/4 inch seam. And keep doing that with all the strips. I didn’t take photos of the sewing together bit! 7. Then I trimmed the edges of the quilt top so it was all neat and even and rectangular. 8. Next I cut some plain calico to go along each side of the rectangle. It’s called sashing when you do this in quilting, I think. It helps the prints or colours pop out by providing some neutral relief. 9. Then I trimmed the edges of the quilt top again. 10. Next. I cut 2 rectangular pieces of sheeting. 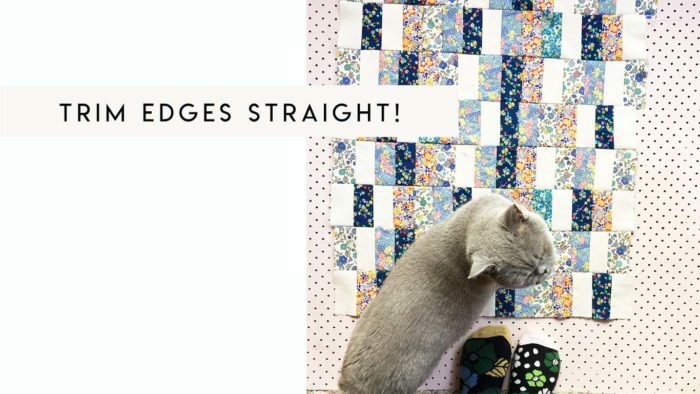 Make sure the rectangles are at least an inch bigger than the quilt top – one would be the ‘Batting’ to make the quilt have a bit of cosy substance and one was the quilt back. 11. Next up, I made a quilt sandwich. On a clean floor, put the quilt backing piece with its right side DOWN. Now put the batting (in this case my other bit of sheet because I could not go and buy batting) on top – it doesn’t matter which way up. Now smooth it all out. Pop the quilt top with its right side UP on top of that. Smooth it all out, making sure you have an inch of ‘batting’ and fabric showing around the edges of your quilt top. 12. Grab your safety pins (special quilting ones are good, but I just had regular ones!) and pin all three layers together neatly and smoothly. No lumps and bumps please. 13. 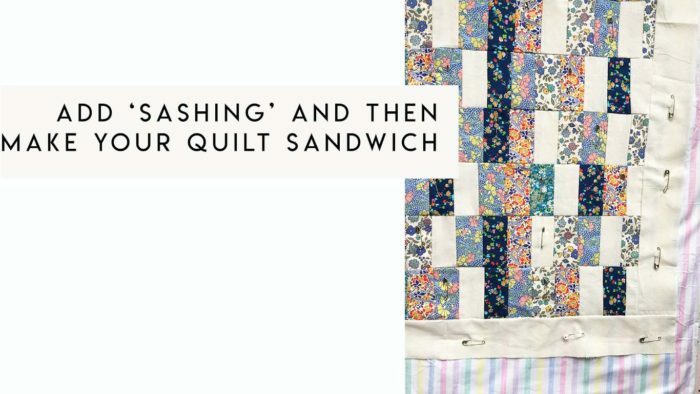 Now head to the sewing machine and with your quilt top at the top of the sandwich (facing up) – begin sewing straight lines. You can mark these lines out if you want, with chalk…. I didn’t do that. I went loosey goosey and didn’t worry if they were straight. So lazy. You can also sew squiggles or any kind of pattern really. Lines are easy though. I did them the full (longest) length of the quilt (top to bottom – not side to side) but you could go any way – or both! Remove your safety pins as you go. 14. I rolled the quilt up as I went to help it fit into the crook of my sewing machine and I took my time. 15. I trimmed all the loose threads. 16. I cut some strips of fabric and sewed them together to make the binding. Then I hand sewed it on. 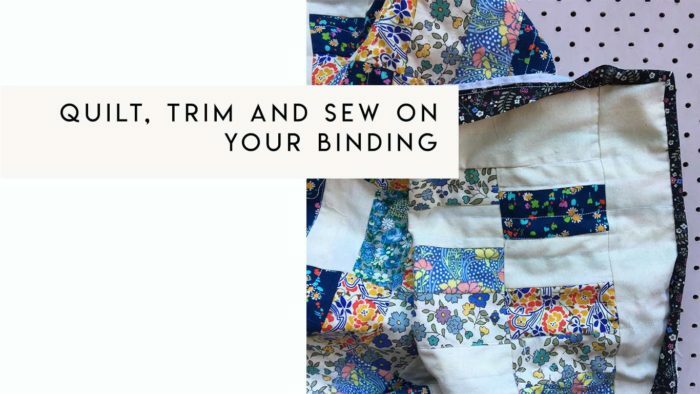 Here is a tutorial on how to make simple straight binding – and one on how to sew it on. Go make a quilt! Maybe start small and see how you like it?! 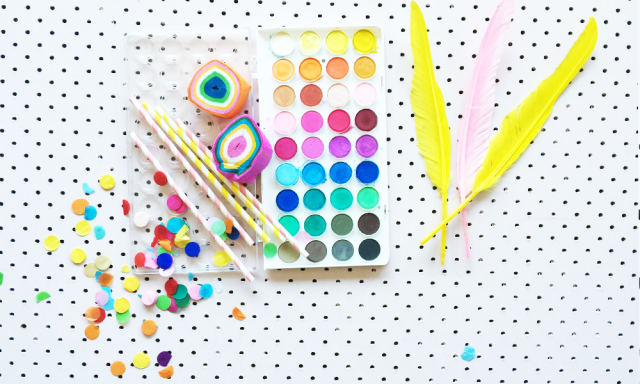 PS: Don’t forget Blog With Pip is on sale at the moment! Learn to blog with me! PPS: I am about to launch this ultra fun thing too! I have always wanted to try to make a quilt out of old clothes of my children, but I have been put off by the (to me) high level of skill and perfection required to make a quilt. This is a great tutorial for me – something I feel I could achieve. Thanks for the tute and the moral support! Gorgeous project, Pip. Lucky Ms Bronte! Excellent post! a project I’ve had in my head for sometime but hasn’t made its way into reality is a patchwork cushion using small bits of fabric from some of the many items of baby/toddler clothing I kept from my kids. I shall have to get to it now! 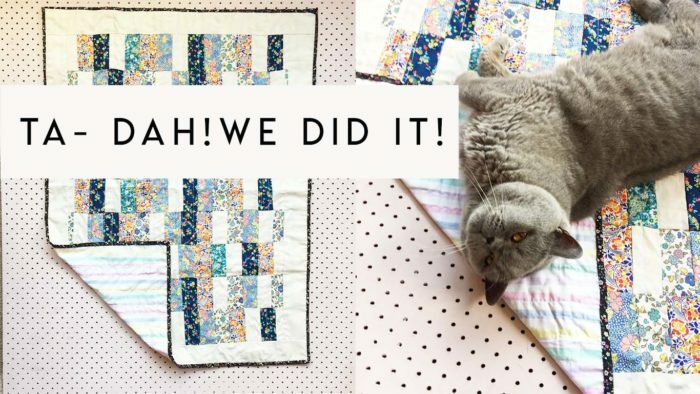 Lovely cat and quilt, great job!